The following list of different kinds of pots and pans isn’t exhaustive, but it will get you started. These are the pots and pans you’ll use the most. You’ll probably use this skillet all the time, so get a good, heavy-duty one. You may wonder, as you browse through your options, why some skillets have rounded, curved sides and some have straight sides. To be more specific, a sauté pan has straight sides, while a frying pan or skillet has rounded sides. You may prefer one or the other. The rounded sides facilitate fast cooking and flipping food around (like when those fancy chefs flip the food into the air by tapping the handle). The curved sides help you turn the food. The straight sides of a sauté pan are better for enclosing liquids like hot oil and broth so they won’t slosh over the sides, and they’re good for braising and stewing. Sauté pans are also more likely to come with lids. Your skillet or sauté pan should be at least 10 or 12 inches in diameter and 2 inches deep, which is ideal for sautéing, braising, frying, and making quick sauces. 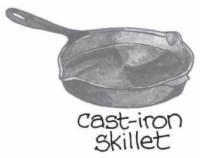 The cast-iron skillet has been a standard in American and European kitchens for hundreds of years and still outperforms contemporary cookware in some respects (for example, browning, blackening, and searing). Better yet, a cast-iron skillet is one of the most inexpensive pans you can find, and it will outlast most other skillets as well. Tag sales and antique shops are loaded with them. Before using a cast-iron skillet for the first time, season it by wiping it with vegetable oil and then heating it on the range on a medium setting for about 2 minutes. In addition, you must thoroughly wipe the skillet dry after washing it to prevent rust. Clean the skillet gently with water and a plastic scrubber. Never scour with metal pads, and never put soap into a cast-iron skillet because it can penetrate the coating and affect the flavor of the food you cook in it later. Look for a skillet with a spout for pouring off fat, if you think you’ll use it for frying. 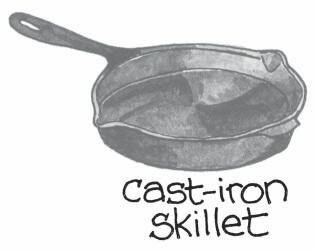 Before storing, wipe the skillet with a few drops of vegetable oil to keep the surface seasoned and to help develop that characteristic nonstick coating of well-used cast iron. A saucepan can be stainless steel with a copper or aluminum core or a combination of metals. It’s an all-around pan used for cooking vegetables, soups, rice, and sauces for pasta and other dishes. You’ll want to own two or maybe three saucepans in different sizes. A 1- to 1-1/2–quart saucepan is perfect for melting small quantities of butter or chocolate or for warming milk. 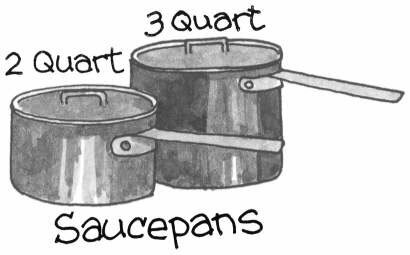 A medium 2- to 3-quart saucepan is essential for making sauces. And saucepans that are 4 quarts or larger are suitable for making soups, steaming vegetables, or boiling a moderate amount of pasta or rice. A well-equipped kitchen should have one oval roasting pan, about 12 inches long, and a large rectangular one, about 14 x 11 inches. An oval roasting pan is suitable for poultry and small roasts; a 14-inch rectangular one can handle two chickens, a large roast, or a load of vegetables from the farmers’ market. The oval one should be enameled cast iron so it can double as a gratin pan; the rectangular pan can be heavy-gauge aluminum or stainless steel. If you can afford only one roasting pan right now, the covered oval pan is probably the most versatile. Another classic you want to own is the versatile 9-x-13-inch baking dish or covered casserole. Whether made of aluminum, glass, or ceramic, it’s great for making casseroles; roasting winter vegetables; or baking brownies, other bar cookies, and cakes. This attractive, all-around stew pot, also called a Dutch oven, is ideal for slow-cooking stews, soups, and all sorts of hearty winter meals. You may want to brown or sear meat in a separate pan before adding it to the Dutch oven because enamel doesn’t brown food as well as cast iron or plain stainless steel. A 4-quart version made by Le Creuset and a similar one from Copco are excellent. 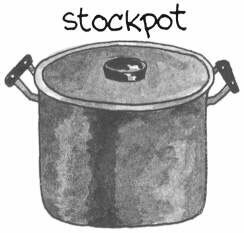 A stockpot is indispensable in any kitchen. It can serve many functions: soup making, braising, steaming, and poaching, to name a few. Look for a tall, narrow, 10- to 14-quart heavy-gauge pot with a tight-fitting lid that can hold a steamer basket. (Inexpensive circular steamers open and close like a fan to fit different sizes of pots and pans.) 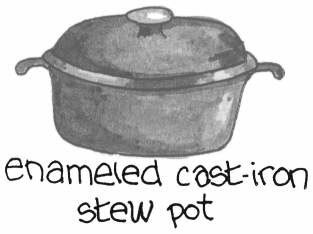 Heavy aluminum is fine for a stockpot; stainless steel costs twice as much.